The house is situated in the middle of a sloped piece of land between the low point and high point of the property. The house sits on a lot with a road on two sides and wooded area on the other two sides. The front of the house faces the woods. The back of the house faces the main road. The driveway connects from the side road and passes through the area between the front of the house and the woods. 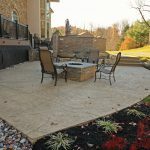 The space between the driveway and the front of the house is the area that needed to be addressed with an outdoor living area. 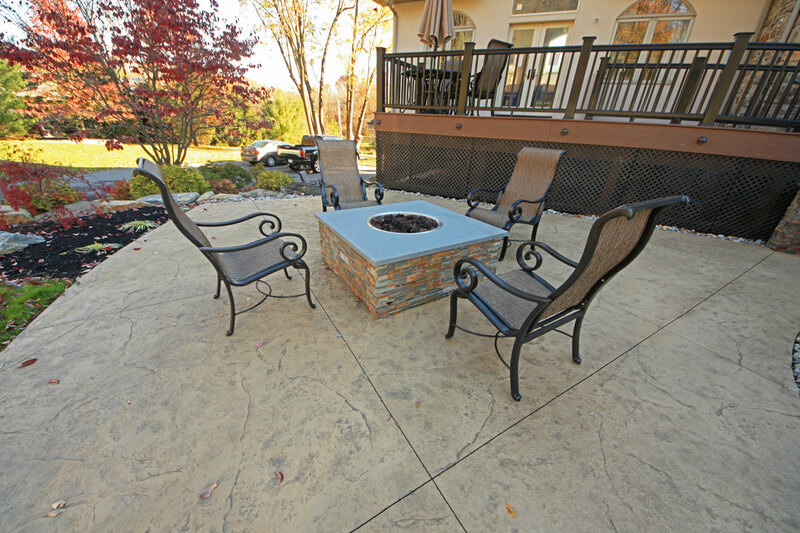 Our clients wanted to add a deck from a living room. 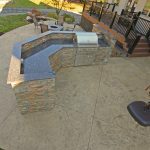 They wanted the deck to lead to a large patio area with outdoor entertaining features. 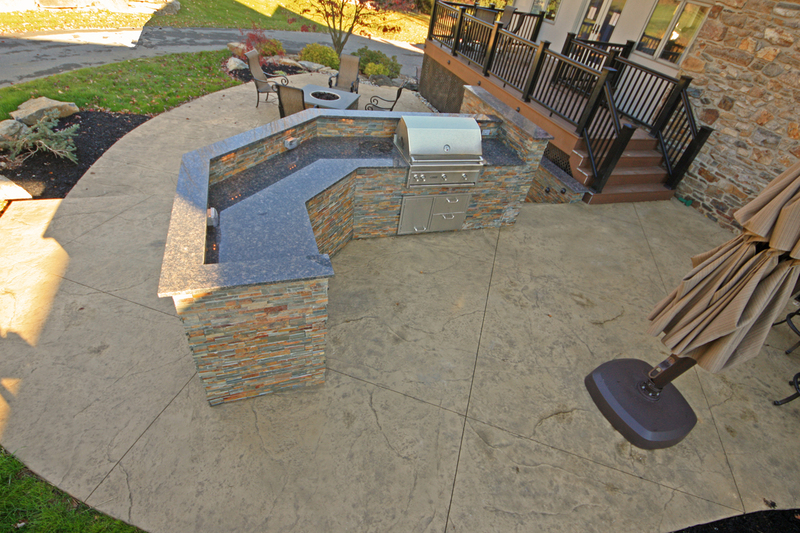 The feature would include an outdoor kitchen and fire pit. There needed to be access to a garage area and the front door directly from the patio. 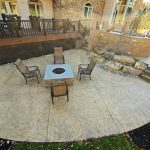 After the new deck was installed, we began work on a two tier patio. 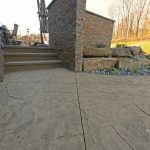 The patio was finished using a seamless slate stamp with a color combination that best matched the facade of the house. 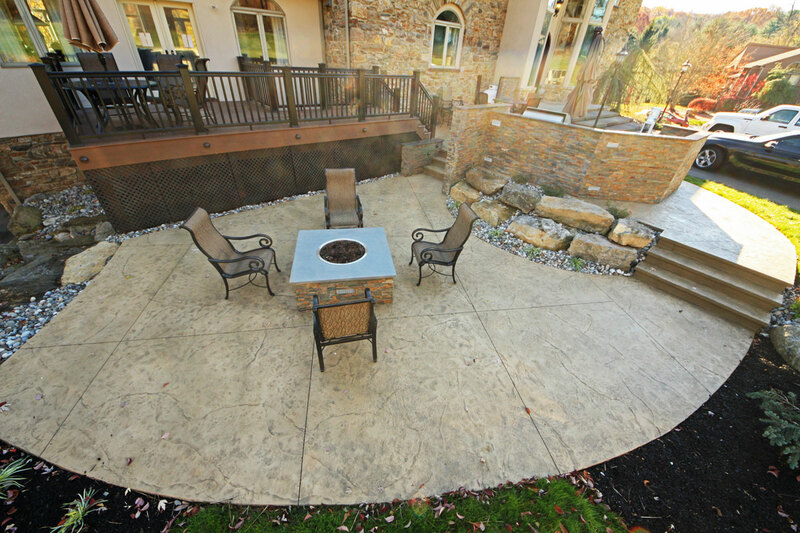 The upper and lower levels of the patio surround a raised landscaping bed. Two concrete stairways lead from the upper level to the lower level. 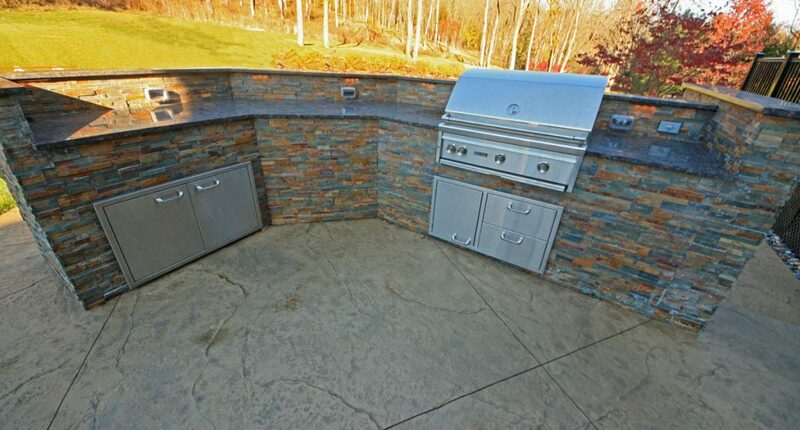 The upper tier of the patio has an outdoor kitchen. 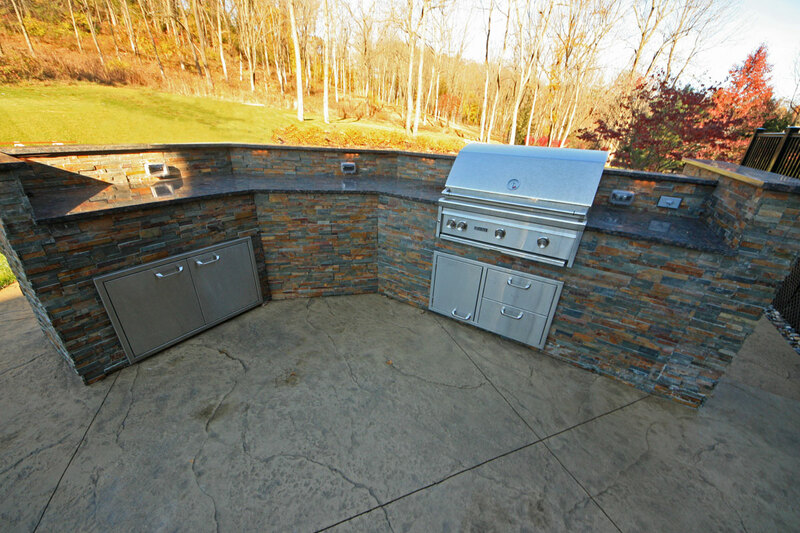 The kitchen includes a grill, cabinets, drawers and plenty of counter space for food preparation. The kitchen lies between the two sets of steps and spans about 15’ total. 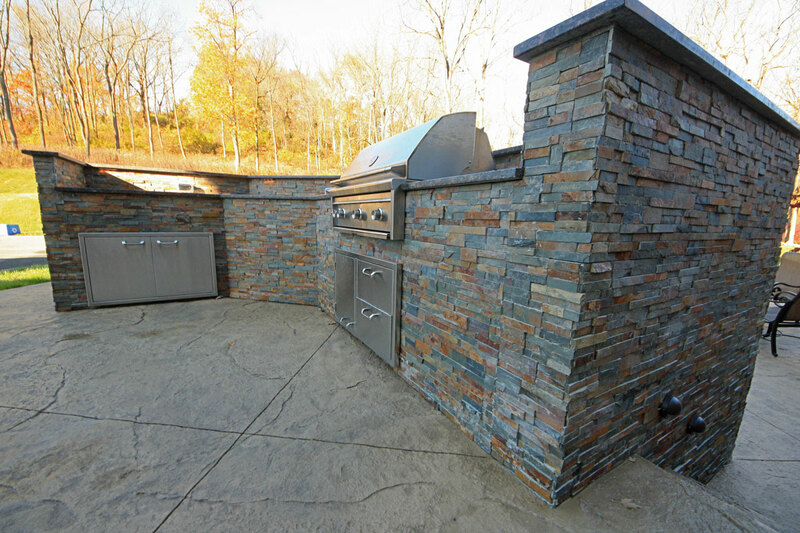 We finished the kitchen in a paneling stone that best matched the house. We used granite for the counter top and added ledge lighting for night time cooking. 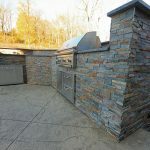 The lower tier of the patio includes a fire pit that was constructed using the same stone as the kitchen and walls. 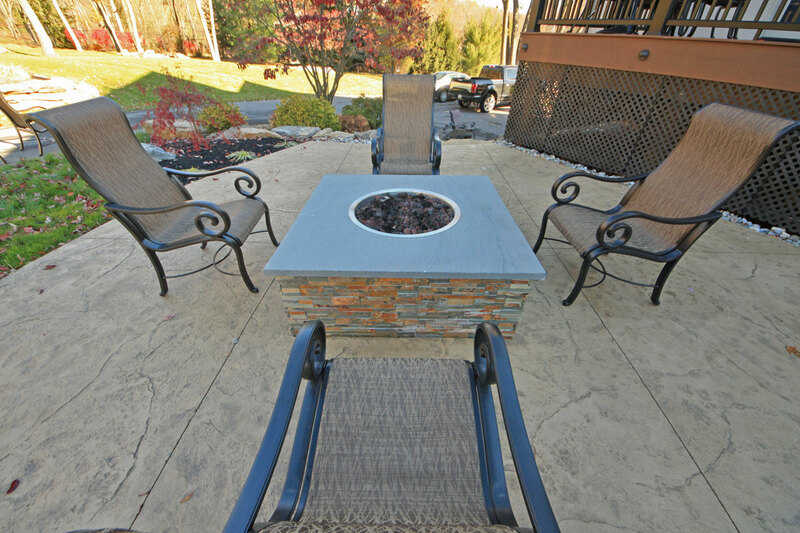 The fire pit is electronically ignited and fueled with natural gas. 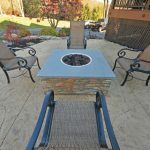 We capped the fire pit using a bluestone. 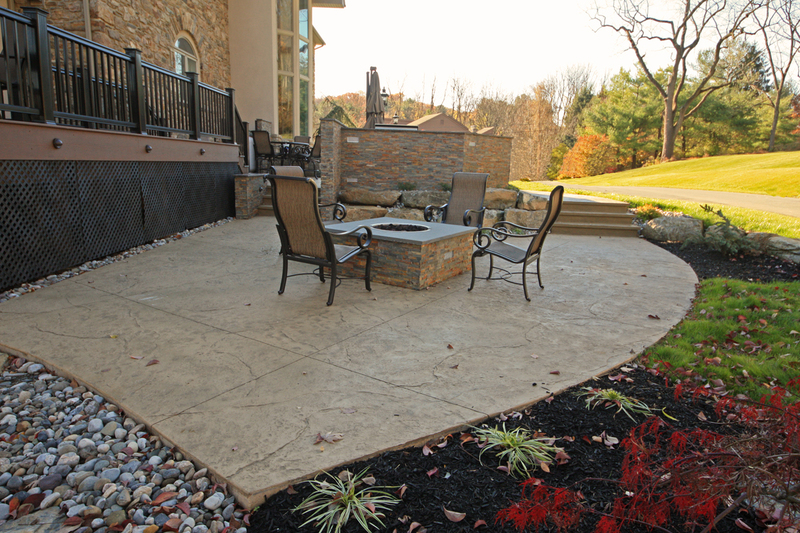 THE FINISHING TOUCHES: Decorative river stone and mulched planting beds with boulders were installed around the patio. Plantings include a Japanese Maple with a combination of colorful perennials and small shrubs. We added hardscape lights into the kitchen as well. 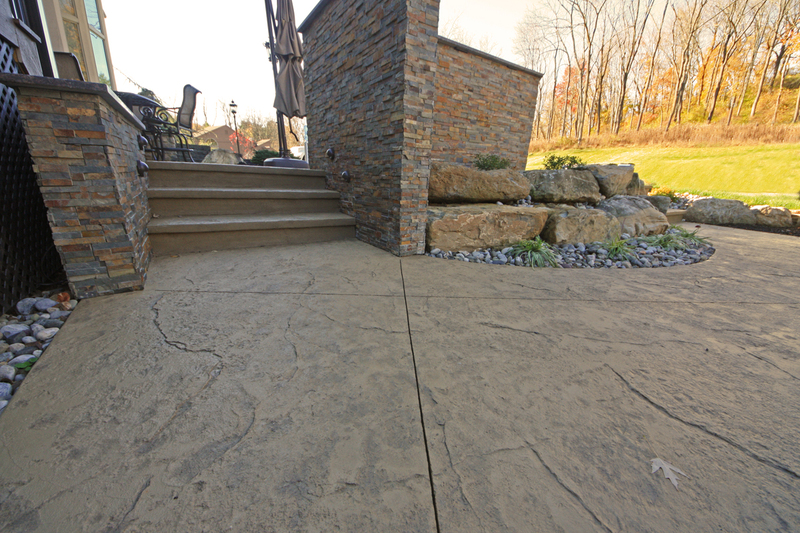 THE STAMPED CONCRETE COLOR COMBINATION: Stedman Buff Color Hardener with Charcoal Release. Integral coloring also added. 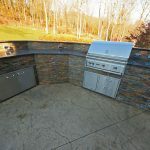 KITCHEN AND FIRE PIT: MSI gold rush colored ledger panel with bluestone cap for the fire pit and a granite counter top.